The winning combination of improved posture, unique 4-Wheel-Drive type action and the shock absorbing benefits of the poles help many individuals to walk comfortably again – even those with balance issues, knee issues or new knees, hip issues or new hips, back issues (including those with rods in their back), weight issues, multiple sclerosis (MS), Parkinson’s (PD), neuropathy, arthritis, bursitis, scoliosis, lumbar stenosis, fibromyalgia, post polio, osteoporosis, stroke recovery and other limitations to walking. Nordic Walking with the Perfect Length Poles and the correct technique is often the answer for athletes, those with weight issues, balance issues, joint issues, ………… The amazing 4-wheel drive action turbocharges walking for athletes and makes walking doable and comfortable for many that are typically uncomfortable due to aches and pains. Often the poles will totally reduce or eliminate those aches and pains. The poles also radically improve balance and stability for those with balance issues too. Nordic Walking is low impact and yet provides a highly effective workout – burning more calories and working more muscle groups than regular walking. Chronic obstructive pulmonary disease (COPD) is one of the most common lung diseases. It makes it difficult to breathe. Walking with the perfect length poles and the correct technique can radically improve the walking campaigns of those suffering from COPD. When using the correct length one-piece Nordic Walking Poles, we are tricked into standing taller, the hips automatically come forward and the shoulders back. Improved biomechanics is a good thing. Keep your fingers relaxed (don’t grip, squeeze or white knuckle the pole grips) and our chin up. Be sure your poles are one-piece and that they are equipped with the fingerless glove type straps. Our one-piece SWIX and EXEL Poles have real Nordic Walking Straps – patented by the Salomon Ski Company. Other poles include no straps, simple loop straps or cheap velcro slings and are equipped with cheap/flimsy twist-locks or flip-locks that attempt to hold the collapsible pole pieces together. Students in my classes that have inhalers have NEVER needed to stop and use them – even on 2-mile hikes and mile-long hills. Quality Nordic Walking Poles can really help make walking doable and more fun for those suffering from COPD and/or asthma. Individuals with COPD and/or asthma should avoid cheap/flimsy 2-piece and 3-piece poles regardless of the marketing hype behind them. Typically collapsible poles are much heavier, they tend to rattle, vibrate, freeze up, gradually collapse or unexpectedly fail altogether. The twist-locks and flip-locks are not user-friendly and are often reported to have failed. 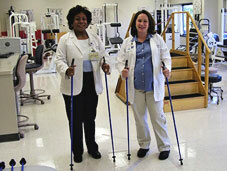 Heavier collapsible poles are not a good idea for seniors, anyone with a balance issue or those with COPD. One-piece poles that are sized correctly will always prove to be lighter, safer, stronger, much more durable and much more user-friendly than poles from China with twist-locks and flip-locks. A happy customer ordered another pair of our Nordic Walking Poles for herself recently. A friend of hers insisted that because of her COPD she couldn’t walk the 1/2 mile to view a waterfall. She reluctantly tried her friend’s SWIX Nordic Walking Poles and was shocked to discover that she could cover the whole mile so effortlessly. She hijacked the poles and happily refused to return them. We shipped out a replacement pair the same day we heard the story. Exercise and a healthier diet would radically reduce the pain and suffering of millions suffering from Type 2 Diabetes. 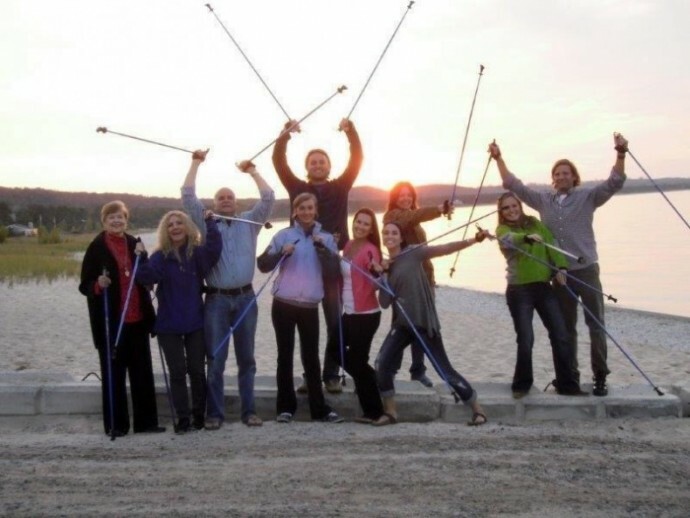 Nordic Walking Poles when sized correctly and when using the proper technique can radically improve balance and stability. Using the Perfect Length Poles is much more comfortable than using a cane, a walker and or pushing a shopping cart. Quality one-piece poles need to be selected for each individual’s specific height. Perfect Length Poles radically improve balance and stability. Perfect length poles help to trick us into walking with a super straight back – better walking posture is biomechanically a good thing. This improved walking posture, when combined with the unique 4-Wheel-Drive type action of walking with poles, radically reduces the stress to the shins, knees, hips, and back.